The only way to create something personal and unique is to somehow involve one’s hands in the formation of the image, that is, draw on the image or alter it manually and selectively at the micro-scale. By “hands” I don’t mean keyboard inputs, I mean mouse movements and the deliberate positioning of elements within an image. Layering, which just introduces a texture to the entire image is more like a coloring or rendering method which is an embellishment of the entire image rather than a deliberate editing of just part of it. Editing is characterized in this case by “selectivity at the micro-scale”. Does layering, masking, image importing and other hand-directed interventions make the fractal art created with it substantially different, and more like the traditional plastic arts (hand formed) or are those additions just trivial or at best secondary embellishments to what is still primarily an art form that revolves around mechanical creativity? Has any fractal artist ever demonstrated a unique personal advantage when it comes to making good fractal art? Meaning, has any example of their artwork something to it beyond just novel parameter permutation (mutationism), something that could be described as their own artistic style and originality? Surely personal style must be the critical indicator for true user-based creativity because unless there is something original and connected only with them, their contribution is just more of the program’s own creative imagery (or another program’s)? In other words, if your own artwork doesn’t have “that something special”, then you’re just another mutationist like the rest of us. The proof that users are “creative eunuchs” is that they are incapable of contributing anything of significance to the graphical gene pool: the process that forms the imagery. Similarly, the proof that they’re not creative eunuchs is that they can add something of artistic merit that the program can’t take credit for. 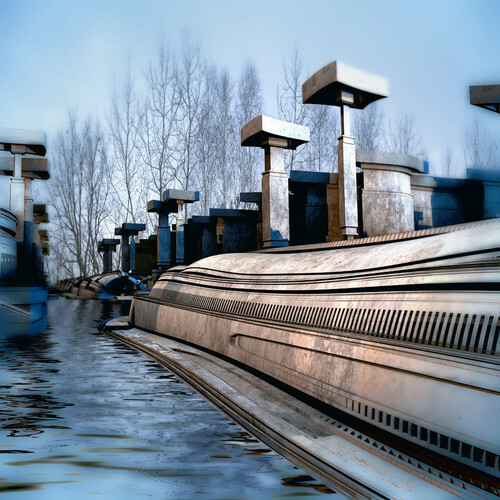 If a user’s own creativity is part of the process then fractal art ought to reflect the person who makes it and not only the program it’s made with (which is often the only consistently recognizable feature of fractal art). If fractal art lacks this personal ingredient, then it’s primarily (or entirely) a product of the automatic, self-operating and independent process. The “artist” is better described as a skilled operator rather than a creative agent; skilled at the discovery of new things rather than the personal creation of them. But that is the Ur-question [earliest, original] of style in our discipline (and all of digital art). Work produced in one fractal program definitely has a distinct and recognizable look than work produced in another. So, does the software, or perhaps its author(s), determine fractal art style, and do Phase One fractal artists, limited by the boundaries of a program’s capabilities, merely pump out variations on a pre-determined look. In other words, does the tool itself have panache — or is stylistic elegance sourced in how individual artists use a given tool? Can editing significantly alter the artistic impression of fractal imagery? 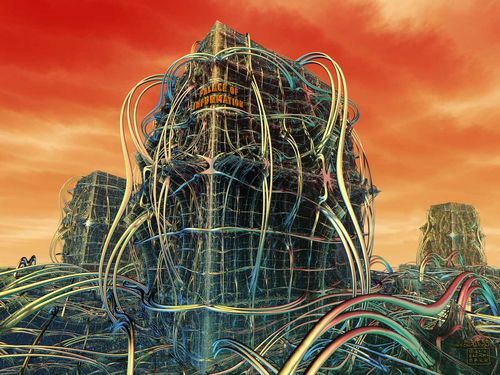 If it can, the user’s contribution can be important and therefore fractal art as an art form has the potential to express the creativity of the artist’s mind as well as the creativity of the fractal mechanism. We all know anyone can alter fractal imagery by hand. The real question is whether it’s significant or not. It should be something we can notice and recognize and (most of us) agree on. If the user can add something significant, then surely there must be personal style because these additions are not automatic and algorithmic, they’re guided and directed by the user and not discretionary: they’re individual, unique and original. Like all impressions of art, there will be a range of opinions. Incidentally, I had a much harder time writing this part of the series than the previous two. I’ve struggled with this posting because it’s all about mixed-media and conceptually that makes it much more complicated than automatism which is practically a mathematical or philosophical concept. Not necessarily easy to grasp but much easier to express. Automatism and mutationism are about absolutes while Image Editing (mixed-media) is all about degrees and impression. The more the artist is involved in the art, the more complicated it gets. Think about that. As I said above, this third part is all about everything to do with fractal art that isn’t automatic and machine generated. This is where the medium of fractal based automatism gets mixed with user inspired and guided modification; it becomes mixed-media. These modifications for the most part take the form of photographic backgrounds and overlays rather than actual digital painting or drawing and therefore almost entirely fall into the subcategory of photomontage. They can have a surprising transformational effect by merely shifting the context in which the fractal imagery is perceived, moving from the abstract to the realistic or sometimes, the sur-realistic. Let’s look at some examples and try to answer that Ultimate Question: Can editing significantly alter the artistic impression of fractal imagery? Time spent browsing Haltenny’s Deviant Art gallery is never wasted. This one is very recent and a perfect example of the symbiotic potential of image editing and fractals. Although Haltenny’s gallery has more sophisticated examples of his photomontage creations, I like this one the best because it’s much more simple and yet much more effective in transforming the fractal imagery. Doesn’t this look just like a modern, university campus in early spring? Or some other modern, institutional setting? I keep thinking this is the university I went to back in the 80’s (1980’s) which was relatively new and had a distinct preference for formed concrete construction. They had drainage problems in the early spring and so you’d often have half-melted snow and ice around buildings. Furthermore, the trees were mostly deciduous and bare of leaves in the early spring. One other prime feature of the campus’ design were the numerous, stylish light posts that made the outdoor spaces feel like a gigantic trendy restaurant at night. The machine didn’t do this, Haltenny did. Haltenny added something to the 3d fractal imagery that changed the context and significantly altered the artistic impression. Even the lighting of the original 3d fractal imagery fits with the dim, early spring daylight and the early approach of evening. In half an hour those lights will come on and the night schools students will start to arrive. Another fine fusion of the photographic and the fractal. Don’t those doors, and particularly the circular vent on the wall between them, look like they were part of the 3d fractal imagery? I don’t think it’s easy to fit imagery together like this so seamlessly. It reminds me of paintings I saw in a book called, Mythopoeikon by Patrick Woodroffe years ago. I think this is why Haltenny was asked to provide conceptual artwork for the recent Marvel movie, Guardians of the Galaxy, Vol II: he has a real knack for showing how fractal imagery easily blends into natural surroundings and creates a seemingly endless other world. I imagine that’s what inspired the movie folks when they looked at his work: they saw immediately what they could be done with it. This is a few years old, but what transformative effect just a background image can have. Makes you want to stay indoors and board up the windows. I think brutaltoad adjusted the coloring a bit too, to make the scary mandelbulb thing look comfy with the rosy trees in the background. No maple syrup harvesting this season! Just like with Haltenny’s work, it’s hard to see the “seams” between the fractal imagery and the photographic. It looks natural and creates something neither of the two mediums were capable of producing on their own. And for that the artist (user) gets the credit, not the machine (or forest). This is genuinely creative work and not just the logical uncovering of parameter permutations. The whole structure is a single fractal shape, not really symmetric. But while making it I decided to use the lower part as a fake reflection of the upper one. Another fine example of the transformational effect of context. I think the fractal image inspired the user’s additions which of course were carried out manually and beyond the automatic mechanisms of the fractal program. You could say this is an elevated context, higher than the automatic one and the artist has completed it. 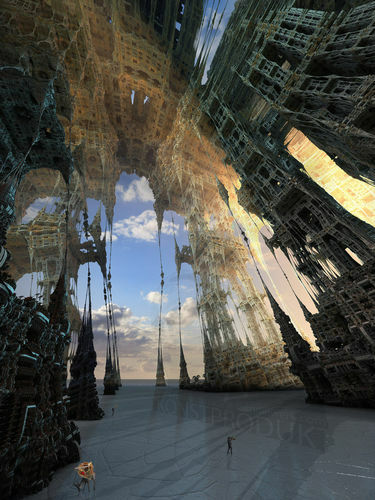 Vidom has many of these panoramic and particularly architectural type 3d fractal images in his gallery. Vidom notes: “The sky above has been replaced by a personal photo. That doesn’t alter the fractal in any way.” The most simple of all manual fractal additions: photo background; just like brutaltoad’s Day of the Triffids: The Cherry Orchard Stories. But again, if I may use the word transformative once more, it changes the context, and the overall effect or impression of the fractal imagery is more than it was before the user manually added the photo which was suggested by their own imagination. When you add the user’s hand to the image formation (even photomontage) you connect their mind. Subsequently, when you remove the hand from the equation, you remove the user’s imagination from the image process. 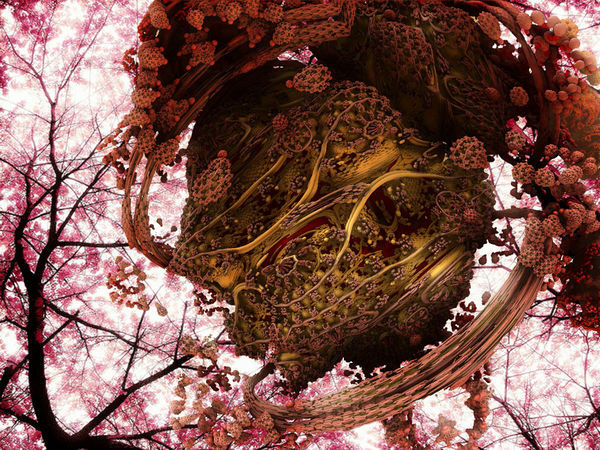 With respect to the Ultimate Question, “Can editing significantly alter the artistic impression of fractal imagery?” I’d say these examples of mixed-media fractal art have shown that it can be done. But I’m not sure I can say they exhibit personal style or the expression of the artist’s mind to a meaningful degree. What I mean by that is that in all these images, the fractal imagery has been elevated to a higher level of artistic impression but the technique they’ve used is generic. This introduces a sort of twilight-zone category I wasn’t anticipating. I like the artwork of each of these artists as do many of the folks on Deviant art but when I take a very technical and theoretical approach to what their work says about the medium and art form of fractal art I see they’ve all transformed the automatic artistry of the machine with their photographic additions but I don’t see it moving beyond that of a simple presentation technique that adds a nice finishing touch but which is also an anonymous one. But in defense of the artists, I don’t think they really ever intended their modifications to do much more than that anyhow. 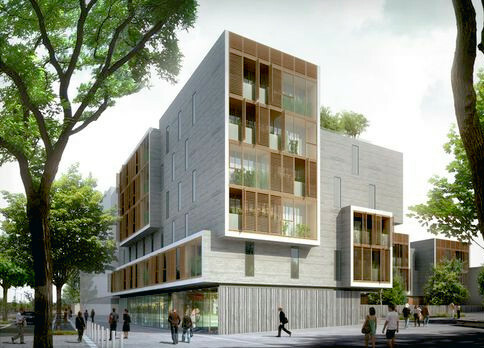 Their goal, I suspect, was to present the fractal imagery in a more imaginative context just as an architect presents their building plans as a real building in a real environment so a potential client can immediately evaluate it in a context that is more familiar to them than a blueprint. It’s all about conceptualizing and that’s why I think Haltenny’s artwork caught the eye of the movie makers from Marvel and made them reach out to him for work as a concept artist. Furthermore, the examples I’ve shown of Haltenny and Vidom are all fractals that exhibit a strong architectural theme and so the technique of “Artist’s Concept” in it’s contextual embellishment is a natural route to take as it fits well with the imagery. We could say the fractal imagery inspires or suggests such illustrative additions. What this all means for creativity in fractal art is: One embellishes and enhances, builds upon the automatic imagery which forms the foundation of the art form. This is important because the algorithmic, mechanical creativity of the program is the primary interest in the final image and what the art form revolves around and is oriented around. 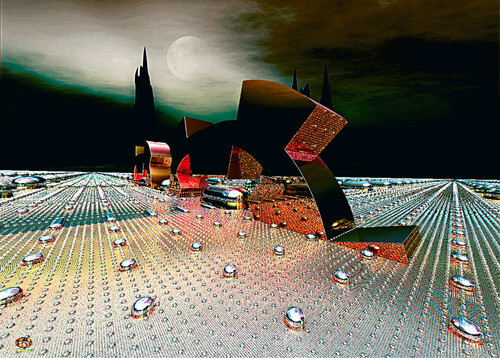 In this Artist’s Concept category (as I call it) the fractal imagery is still the leading creative element of the artwork but it’s been presented in a more engaging and imaginative context through a collage-like technique called photomontage. The use of photography makes the resulting work much less personalized and therefore less supportive of a personal style even if it is a personally creative act and not something the fractal program can take credit for. I wasn’t expecting that. The lump of rough stratified stuff in the mid-ground was created using an automatic technique called “grattage” which is French for scraping. Ernst placed the canvas over some rough boards and other surfaces and then scraped paint across them just as one would rub a pencil over a sheet of paper placed on a surface to create a pencil rubbing. Grattage is paint rubbing, you could say. 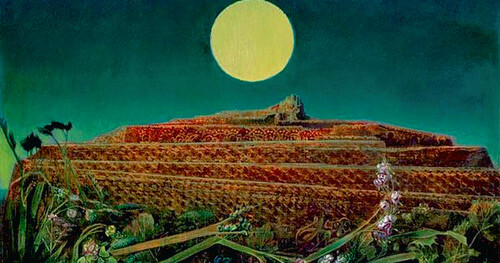 Because Ernst worked in a non-digital medium, he couldn’t overlay photographic imagery so he painted by hand the vegetation in the foreground (he was a very good painter as well) and the simple gradient for the sky in the background. The automatic imagery is architectural and “structural” in its appearance and no doubt that is what suggested and inspired Ernst’s contextualization of it as the concept of “The Entire City” (La Ville entière). The title is an “artistically active” element as well, but that’s another matter. Compare it with the fractal examples above; are they not all the same kind of contextual transposition of automatic imagery (scene shifting)? When the same artistic situations and challenges arise, whether in the 1930’s or 2010’s it’s not surprising that the same solutions occur in the minds of artists who otherwise would have no connection to each other. It’s the medium that connects them. Ernst’s work is considered a fine example of automatism and not oil painting. The manually painted elements are supportive and embellishments that serve the function of presenting the work in a completed and more easily interpreted way. Architectural fractal works I think function the same way. Just a different form of automatism. 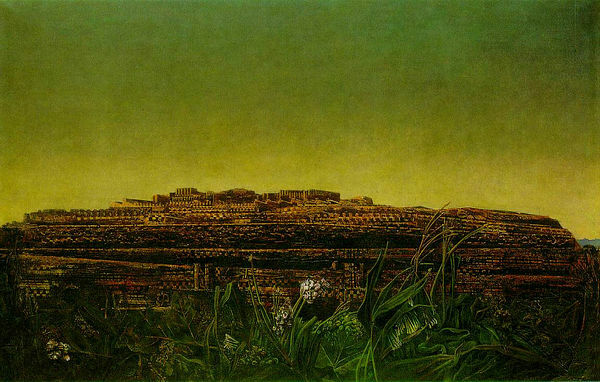 Ernst made a series of grattage paintings called The Entire City over a number of years. It’s interesting to compare how he “edited” the automatic imagery and embellished it in different examples. The central focus on the automatically created, “scraped” imagery is common to all of them while the manual touches vary slightly. The scraped imagery here is different. But then there is no such thing as cut and paste in oil painting. Is there more than simple photomontage? So the examples of Haltenny, brutaltoad and Vidom have clearly shown that fractal art’s creativity can be more than just that of automatism when edited by a capable artist. Their examples were simple but effective in presenting fractals in a more imaginative context. 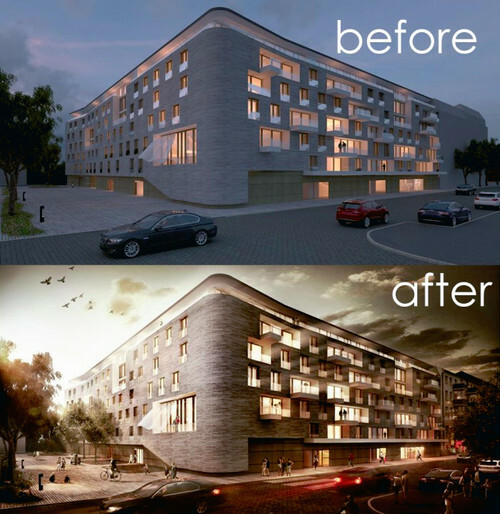 But embellishing architectural fractal imagery with architectural presentation elements doesn’t change the effect of the actual fractal image, it just enhances it by changing, literally, the scenery. Some editing can change what the fractal imagery means and what it’s artistic effect is. This is a much more subtle form of editing and probably elicits a wider range of reactions (appreciation) from viewers. Architectural works are simpler to interpret and easier to understand. 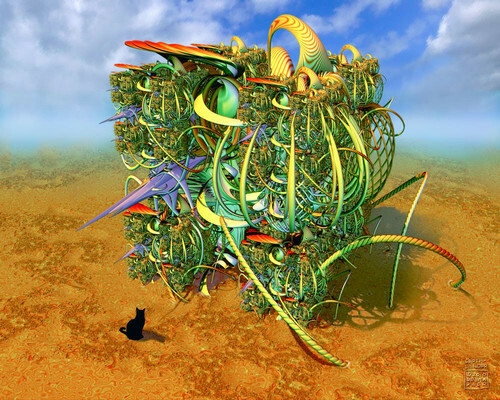 This caught my eye on Fractalforums.com in 2011 when I wrote the posting, Art of the Strange Place. 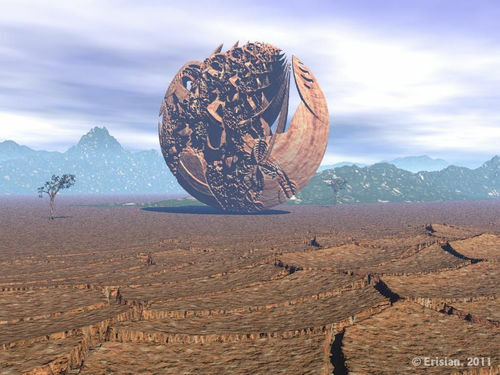 The fractal component is just the round object in the mid-ground (from Tierazon) and the “background” imagery was made in Bryce, a 3d graphics rendering program. It’s something of an oddity but now, 6 years later, it’s rather fascinating from a theoretical perspective because it a good example of user creativity particularly because of it’s unusual program combinations. I didn’t know someone could 3d-ify something from Tierazon, a single layer, 2d fractal program. It reminds me of Ernst’s The Entire City because the automatic imagery here (fractal) takes on a whole new feel and meaning than it would have in the fractal program or presented alone. It also has a slightly surreal feel to it because it’s something of a mystery what it is and represents but yet it suggests …something strange. Man, 2001, isn’t that just ancient? I picked this image out for the posting on Paul Lee’s memorial and every time I look at it I think he must have intended it to be a self-portrait. Surely a self-portrait must be the ultimate form of personalization? But with a fractal program? Or, in this case, a quaternion program? Look at the QuaSZ (a program by Terry Gintz) image (dark, complex shape). What kind of person could see themself in a “quaternion, hypercomplex, cubic Mandelbrot, complexified quaternion and octonion renderings of the Mandelbrot set and Julia sets”? That’s him walking along briskly with his hands on his hips and his right foot extended out and wearing a self-made medieval leather boot. As for the background, it could easily be anywhere in west Texas, although I think Paul was from the greener east Texas. Hey, when get’s going he really travels! Notice how dark, complex and convoluted the shape is. The bright sun just makes the shadows darker. I think he has a guitar over his shoulder. In both Erisian’s and Paul’s images, the automatic imagery has taken on a dual transformation: both the context as well as the meaning and function of the imagery itself has changed from its original state in the program that made it. JoeFRAQ has created a series of images incorporating the somewhat geometric element of a piano keyboard into the fractal imagery. This is the best one in my opinion because like many of the examples in this posting, the non-fractal imagery is minimal and yet radically transforms and re imagines the fractal. Without the keyboard the 3d fractal imagery has a clear mechanical appearance but with the keyboard inserted below it, there’s a sudden coherence to that previously ambiguous mechanical assortment of things. 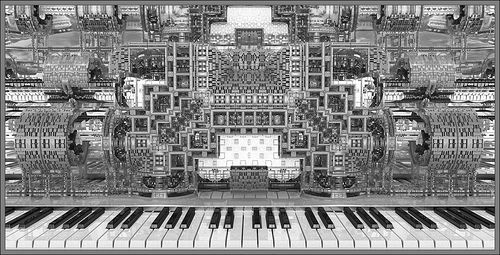 Furthermore, the simple geometric pattern of the piano keys fits in visually with the fractal imagery and it’s new role as the machinery of an exposed upright piano (or organ). A pretty ordinary sky, a pretty ordinary, shiny 3d floor, a typical burro or deer or something, and a nondescript figure doing something (but what?) and something else with …a balloon? But what an extraordinary result! Many 3d fractals are panoramic but this one seems to extend beyond space and time. It’s impossible architecture and yet it stands solidly and majestically: the impossible made certain. It has a Dali-esque eternal time feel to it. Everything moves towards the horizon and yet it is frozen in that “moving” state. The futility or stability of change? I guess asking if Mandelwerk’s image here answers our Ultimate Question is unnecessary. I can’t see the effect of just the fractal imagery alone doing what this image does. There’s a mood and a mysterious tone to the architecture now. Obviously the fractal imagery has a lot to do with it, but the artist’s editing has created a symbiotic relationship between the two sources of creativity. I can’t really say which one is the stronger one because they work so well together and seem to do so much more than they would have alone. All he did was add an arid sky to the background and do some typography and suddenly it’s one of those scenes that catches your eye while driving down the interstate on a family vacation. But with no cars parked outside it’s probably not open any more. Still, it’s worth stopping just to take a photo and look for ghosts. I know this was not a serious attempt at mixed media art, but for that reason it’s even more noteworthy. With respect to personal style… who does “color” like Mclarekin does? Cheap effect, eh? Masking and layering and not too much of that, either. 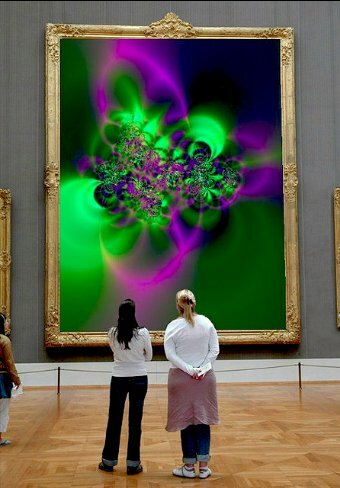 But imagine a gigantic, old-school style fractal in a big art gallery with tourists admiring it like it was the work of an Old Master… What if everyone’s introduction to fractal art was in such an environment? What if people compared it to the Picassos and Renoirs beside it? What if people asked not “is it art?” but rather, “what kind of art is this?” What if fractal art was innocent until proven guilty? (What if everything we looked at was “art” until proven guilty?) Maybe this one is the best example of editing significantly altering the artistic impression of the fractal imagery? Look at how high that one-layer, retro fractal has risen at the hands of its human editor. It’s as if Cinderella’s Godmother composed this epic transformation. Who can say it still looks like a pumpkin? I don’t know how popular these sorts of images by DorianoArt are with others in the fractal world but there’s something about them that I just think is great. Maybe it takes me back to the days of sci-fi paperback covers when this sort of artwork was both futuristic as well as artistically innovative. Space is big, colorful, well designed like a ritzy hotel and stylish. With respect to personal style, Doriano is one of the very few who I sense has actually achieved a look which one could call individual and personal. I can’t think right away of anyone else who makes images like this and when I see new ones as thumbnails in the Deviant Art recent uploads page, I recognize them right away as his and I’ve never been wrong. That ought to be a good indicator of personal style: you’re instantly recognized in a police line-up. Your artwork is identifiable; the opposite of anonymous. Or is he just the only one to settle on this theme? I have been Videogame Software Manager of Atari Corp, and worked in advertising for a Musical Int. Distribution. Now I do Art and Music privately and study Western and Oriental Astrology. 70’s ish or early 80’s ish? The spectral, prismatic color turns ordinary “silver” into technicolor tundra. The only thing that bothers me about this one is I get the song, “Dancing Queen” by Abba running through my head when I look at it. The green cloud moon sky and silhouettes of a Lombardy poplars (graveyards) is an ominous and unusual addition to such a glittery scene. Could be the cover to a sci-fi murder mystery. Whether you’re a big fan of these images by Doriano or not, you’ve got to agree the guy has a style like no one else. That’s a big thing in fractal art. 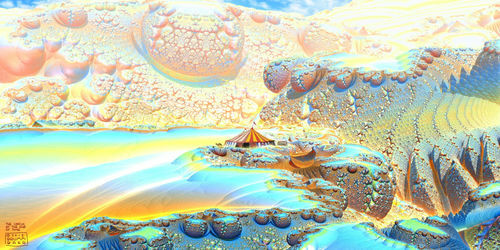 The paintings are based on fractal designs, calculated on a computer using commercial and some offbeat programs. After the creation by the fractal generators, the design is either moved into a 3D program like 3D Max and further treated, or taken into photoshop, where you tweak the color and composites. After several testprints, a high resolution version is painted in the computer with the help of a Wacom-tablet. Finally the image is professionally printed on canvas or paper guarantied to last a hundred years. Once the canvas is stretched, it is ready to be painted on. Layers of oil, acrylics and varnish give me the ability to create a vibrant painting, using some techniques of the old masters. This goes on until the painting is finished. Every painting is a single, unique piece — nevertheless, once a painting is finalized, it is possible to do prints in any size on any permissible material. The images are very transformative in context, for sure, but I’m not sure the fractal imagery is radically different in its intended interpretation from what it was in the program: it’s still itself, so to speak. 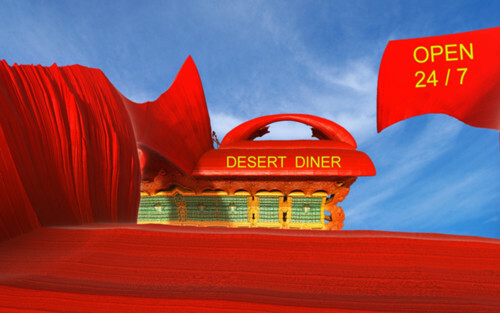 They’re presented as eccentric architecture and machines which is not far from what they are natively. However, Brummbaer has certainly created a very original style in the images overall. I think one would recognize a new image by him by its style unless he attempted something radically different. Here’s an example of a “new one” not from his Tralfamadore series that fits in a bit more with the kind of editing work that many other fractal artists do and is a possible example of recognizable style. Does it jump out as “Brummbaer” if one ignores the distinctive signature logo in the bottom left? He’s made good use of the golden cloud-like background that seems to actually be part of the 3d fractal structure. Perhaps he lightened it in Photoshop to give it a distance effect. The image has a neat coherence to it that his other images also have on his Tralfamadore site. What about the great Ultra Fractalists? 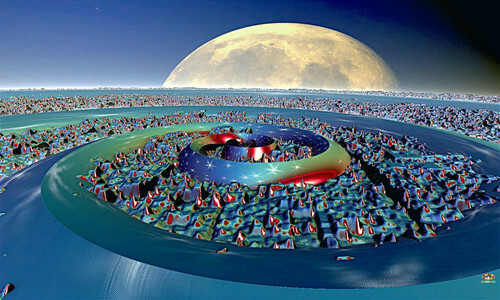 Janet Parke was a very big name in fractal art and perhaps still is in some circles. One of the things she was known for was the intense layering and masking and generally speaking, user-based tweaking of images. She was well known for her online courses that taught both the techniques of using Ultra Fractal as well as the artistic thinking and style behind the application of those technical skills. Suffice it to say that this image here has been edited or altered in a special user-inspired way and not just a “mutation” that crawled onto the land. As for personal style, I can honestly say, as I think anyone who looks over similar Ultra Fractal type images of that time, that some artists can be better at this sort of style than others but that none of them have ever been, or will likely ever be unique or distinguished at it. It is, in my opinion, a form of embellishment, but that may have been the artist’s intentions even if they never saw it that way themselves or described it like that. If you can believe it, Ultra Fractal’s layering and the techniques of “post-processing” used to be a controversial subject in the fractal art world. But that has all changed in a decade (or two). Time is something of a pilgrimage too, I suppose. Looking for something categorically different…. That’s what I’m trying to do here with personal style. It doesn’t have to be a whole bunch of images that consistently portray a novel form of artistry or creative fingerprint like the works of van Gogh or Dali. It can be just one image that does something with the imagery created by a fractal program that comes from the user’s own thoughts and mind and betrays the author’s identity: a fresh, original look for fractal art. A tell-tale sign somewhere that gives a clue as to the artist’s identity. What passes for personal style in fractal art in the few cases I’ve found it, or found a hint of it, is mostly doing something that no one else has discovered can be done or doing something that no one else has bothered to do. In short, doing what no one else is doing but could (perhaps) do. 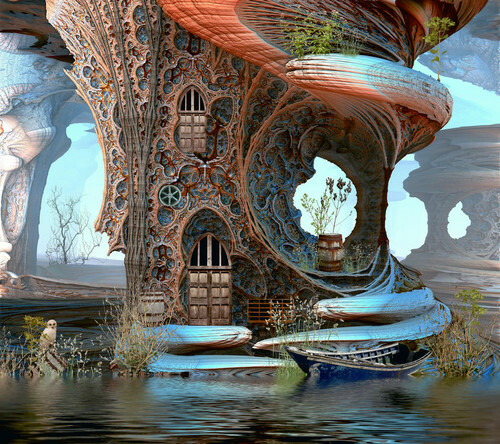 It’s not the exclusivity of a personal domain but rather the exclusivity of a remote domain that’s hard to find or just eccentric; this is what “personal” style is in fractal art. Don’t get me wrong: There is such a thing as good fractal art and there is such a thing as a good fractal artist. But the goodness is in the machine skills and creative embellishments. There is nothing that overshadows or takes the focus off of the machine’s artistry although it’s not impossible for it happen. Perhaps a few of the examples I’ve shown have come close to that depending on how you see them yourself. To quote from this long posting, I said above: What this all means for creativity in fractal art is: One embellishes and enhances, builds upon the automatic imagery which forms the foundation of the art form. This is important because the algorithmic, mechanical creativity of the program is the primary interest in the final image and what the art form revolves around and is oriented around. But this is exactly the same sort of strategy that Max Ernst, the great surrealist painter and pioneer of automatism adopted when working with “the fractal art of his time”. So it’s not a failure of artists to be unable to personalize automatic imagery, it’s the nature of automatic imagery that it resists personalization, and in its sovereignty and independence (self-operation) allows users to assist and embellish and recontextualize it, but not to influence it directly. 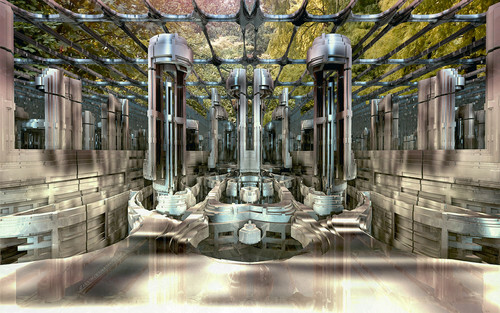 The nature of creativity in fractal art is that it’s primarily mechanical and like all automatism, that is what drives the artistry, inspires the editorial revisions and additions, and generally speaking, is the star of the whole show. Fractal art works differently than painting, drawing, sculpture or any of the other plastic (hand formed) arts. It’s a different kind of artistry and it’s name is automatism. It’s kind of like splitting hairs I think. 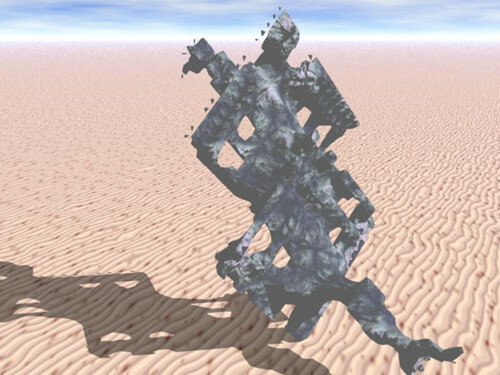 While fractals can be automatically ‘generated’, there is a conscious decision on the artists part on what formulas to combine, and what variables to adjust beyond the default settings to visually change the looks of the shapes and structures in specific ways. As far as I know, there is no automated process that can make any kind of decision to alter the looks of a fractal image in any way other than a random mutation. We start with a specific formula or combination of formulas, and that is a conscious decision. Nothing is generated until we first make that decision. So to me, just choosing a combination of formulas is already part of creating something. And that’s totally ignoring the fact that those combined formulas will most probably render a total piece of junk or very generic and easily reproduced image in their default settings. With further conscious decisions made by visual interpretation of what we see, we than ‘create’ something that represents our vision. So how is that different than the following example: Someone creates a still life image. They create it by posing a bunch of wild flowers and fruit and containers such as baskets and vases. It’s all arranged on a table setting with nice lighting and appropriate matching background. They didn’t create any specific item in the image themselves. So how is that different than consciously choosing formulas to combine, and actively adjusting variables from their default setting to achieve a visual goal? Formula one is my fruit, formula two is my flower, formula three is my container and formula four is my table. Of course I understand the point you try to make too. For instance I probably couldn’t do very specific edits to the fractal image within the program itself. But that’s a limitation within the program, not a limiting factor in our ability to consciously create a unique image that the program cannot possibly randomly generate on its own. Good question, about the still life. It’s all about medium. What we can do, not what we want to do or think we do. With the still life: say it’s an art class and they’re all painting the same still life scene. How many different paintings would you get? Probably one for each student. Imagine it’s a photography class. How many different photos would you get? Maybe only two or three for the same number of students. And now a 3d fractal class. How many different images? Only one. Of course, they’d all start diverging from that original parameter state and not sticking to the original parameter file. And there’s the mutational aspect. You’re thinking of making choices and doing things as creative but they’re only creative because the program reacts that way –the program creates something. Also, is it really a conscious decision to create something when you don’t know what it will look like? It’s a guess. But that’s the nature of automatism: we work the machinery. There is a skill in all this of course and we see it in the quality (artistic interest) of the work different people make. But it’s skill in discovering or guessing or experimenting with the program. The bottom line is that in automatism, which is what I’m saying fractal art essentially is, the artwork is an expression of the mechanism you use and good automatism is good experimentation and of course the artistic sensibility to spot it and save it when it happens. Random parameter settings just prove that the machine can work all on it’s own. The user provides intelligent control instead of random (thoughtless) control. But I’m sure you’ve occasionally done something accidental or unintentional and stumbled over something interesting because of it. Apparently Columbus got lost on his way to the New World. In the oil painting medium, the artist can do anything. Imagine if Salvadore Dali was in the still life painting class; I’ll bet we’d be able to spot his interpretation of still life. But if Dali was in the fractal class his work would be much more anonymous. He’d be creatively inhibited. It’s a different medium.